Repertory Company Theatre, through a special grant from Ann and Charles Eisemann Arts Innovation Initiative, will host a new multicultural outreach program, BRIDGES, designed to bring cultural groups, arts organizations, artists and communities together through the arts. The two-part event is scheduled for February and March at RCT’s new theatre on Coit Road. For more information, click here. Walking into Richardson Bike Mart feels more like stumbling into a cyclist’s fever dream. Clusters of bicycles line the walls, the floor and even hang from the ceiling. At any given time owner and President Woody Smith said at least 1,000 bicycles are ready for purchase. Combine that with the roughly 500 warehoused bikes waiting to be assembled and another 1,500 housed at nearby locations, and what results is a companywide inventory that rivals shops nationally and perhaps even globally, Smith said. The business’s flagship location at Coit and Campbell roads in Richardson has been hailed by Trek Bicycle Corp. as the largest bike-specific shop in the world. And while Smith cannot swear to the accuracy of that statement, he is certain that it is at least the largest in the Southwest. 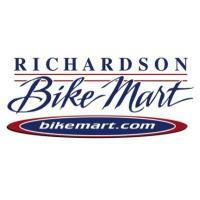 In total the bike mart comprises 33,200 square feet.